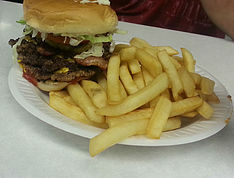 For 40+ years, the grill at Edwards Pharmacy has been a popular eating spot in the town of Ayden. People have come to experience great food in a friendly atmosphere. No matter what you are craving, we know our food will definitely satisfy your appetite. What do you think of when you say “grill”? Hotdogs, hamburgers, and cheeseburgers right? Well, we have those too, but we also have a wide variety of foods. 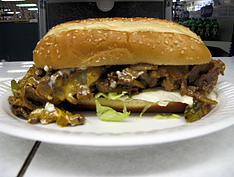 Fried and grilled chicken, philly-style cheesesteaks, ham or turkey club sandwiches, BLT’s, grilled cheese sandwiches, vegetable beef soup, freshly prepared chef salads, and garden salads are just a few of the great foods we serve. 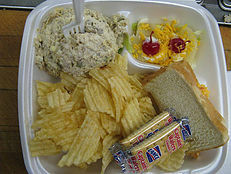 If you don’t want any of those, try our homemade chicken salad and pimento cheese. These are available in sandwiches, trays, or our crowd favorite “cold plate”. Breakfast is also an important part of the menu at the grill. We have plates consisting of eggs, your choice of sausage or bacon, grits, toast, and a hot cup of coffee. We do bacon and egg or sausage and egg sandwiches too. Sausage dogs are always a crowd favorite. Just choose whether you want fresh or smoked sausage and we’ll fix you right up. And here at the grill, breakfast is served up until 11:00 A.M.. Those are foods you can get every single day here at the Edwards Pharmacy’s Grill. However, we also have foods that are not on our regular menu. We serve daily lunch specials that are freshly prepared every morning. Our lunch specials, changing daily, include hamburger steak, gravy and mashed potatoes, spaghetti with garlic bread, fried pork chops with your choice of vegetables. Don’t forget about dessert! We have ice cream, whether you want a sundae or just a couple of scoops. Our old fashioned milkshakes are always a hit. Remember those days of freshly squeezed lemonades and orangeades? Yes, we have those too! Some important factors to remember about our grill is that our chicken salad and pimento cheese are made from scratch, made fresh every day. We use fresh produce from local farmers, because we believe in community support and growth. So the next time you’re in Ayden and you hear your stomach growl, pull into the parking lot here at Edwards Pharmacy and come experience great food at great prices, and great people!